I've noticed that for both my husband and I, there are multiple products in our lives that we purchase simply because of routine. That's the salad dressing that my mom always bought, so now it's the one I get. That's the deodorant his parents got for him way back when, so now it's the only one he uses. That sort of thing. When it comes to fabric softener, it isn't something that we were using around here because it just wasn't an item that either of us had ever really used. Every time I was folding pile after pile of laundry, could they have been softer? Or smelled nicer? I don't know, it's just the way that things were done. However, thanks to CleanItSupply.com, we were soon able to find out just what our laundry routine was missing by including the sweet scent and plush feel of Final Touch Fabric Softener. It's no secret that we're big fans of the ease and convenience of using CleanItSupply.com and their extensive line of products to keep our house clean and running smoothly... without breaking the bank. Everything from laundry products to cleaning supplies (and everything in between) can be found in one place and delivered in bulk right to your front door for less. It doesn't get much easier than that! Therefore, when a case of Final Touch Fabric Softener arrived, it didn't take long before I had happily added it to our laundry lineup. 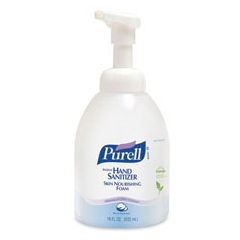 The four 120-ounce bottles are just the thing to add that finishing touch to a machine full of laundry and each bottle holds enough of the liquid for 60 loads. 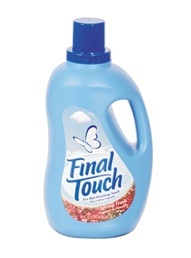 Also available in a Lavender scent, I was eager to begin using Final Touch to see just how soft and springtime-fresh it could leave my family's clothes. As this fabric softener is safe for High Efficiency machines, I wasn't worried about pouring the recommended amount right in and waiting to see the difference it could provide. Right away I noticed that the Spring Fresh scent was sweet but not at all in an overpowering type of way. As I knew my husband probably wouldn't be too happy to head to work smelling like flowery perfume (something I'm not a huge fan of either), seeing that wasn't the case quickly alleviated my main concern. Instead, our clothes were noticeably more soft, smooth and fluffy and the fragrance was just enough to be refreshing. When it comes to pulling on a favorite t-shirt or snuggling down into a set of sheets, adding Final Touch Fabric Softener to our laundry has made it just all the more better! Even better, as CleanItSupply makes it easy to stock up with purchases in bulk, having four bottles in this case of fabric softener ensures that I won't have to wonder if we have any in the house for quite some time to come or remember when we last purchased it. Instead, my laundry room is stocked and ready, which is a huge benefit of buying in bulk for just about anything. CleanItSupply.com really does have the selection, variety, and affordability that any consumer looks for when they shop. Their guaranteed lowest prices (if you find one lower anywhere, they'll beat it!) and lightning-fast shipping means you'll always find a deal and you'll get it quickly. This entire case of Final Touch would be found for around $25 elsewhere but is only $14.88 from CleanItSupply - a 40% savings! - and it's all delivered right to your front door. 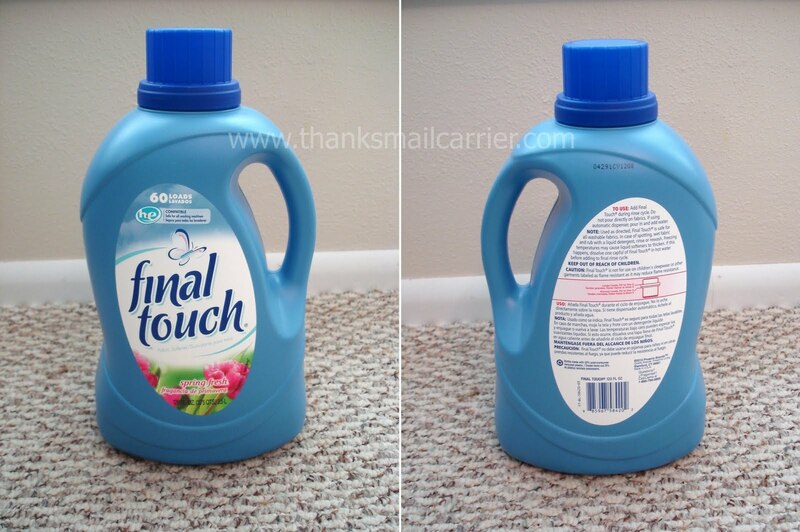 Two lucky people will win a case (4 bottles) of Final Touch Fabric Softener from CleanItSupply! To enter to win: Visit CleanItSupply.com and tell me an item there that you would love to have delivered in bulk. 2 Extra Entries (per method) if you follow CleanItSupply.com on Twitter, Like them on Facebook and/or sign up for CleanItSupply's Super Saving Program. 2 Extra Entries (per follow method) if you follow me publicly with Google Friend Connect, subscribe to my RSS feed, subscribe to Thanks, Mail Carrier by email, become a fan on Facebook, or add Thanks, Mail Carrier to your blogroll. 5 Extra Entries if you blog about CleanItSupply.com and link it to CleanItSupply.com and this giveaway. Please leave an address where it can be found. Giveaway will end on October 7th at 11:59pm CST. Do me the favor of leaving an email address or making absolutely sure it is visible in your profile, I have to have a way to contact the winner. The winner will be chosen by random.org and announced here as well as emailed and will have 48 hours to contact me or respond to notification or a new winner will be chosen. This giveaway is open to continental U.S. residents only. A big thank you to CleanItSupply.com for providing a case of Final Touch Fabric Softener for me to review as well as for one lucky giveaway winner. The opinions shared are my own and honest and if you really need to see more, click here to see how I roll. Paper towels! Paper towels in bulk means less bulk in the grocery cart!! I liked Cleanitsupply on Facebook. I would love to have Tide Laundry Detergent delivered in bulk. I can always use paper towels or toilet paper. Like them on Facebook - DONE! sign up for CleanItSupply's Super Saving Program. - DONE! follow me publicly with Google Friend Connect - DONE! subscribe to Thanks, Mail Carrier by email,- DONE! become a fan on Facebook - DONE! I'd love to have Bounty Basic Paper Towels in bulk! I'd love to have Charmin Ultra delivered in bulk. 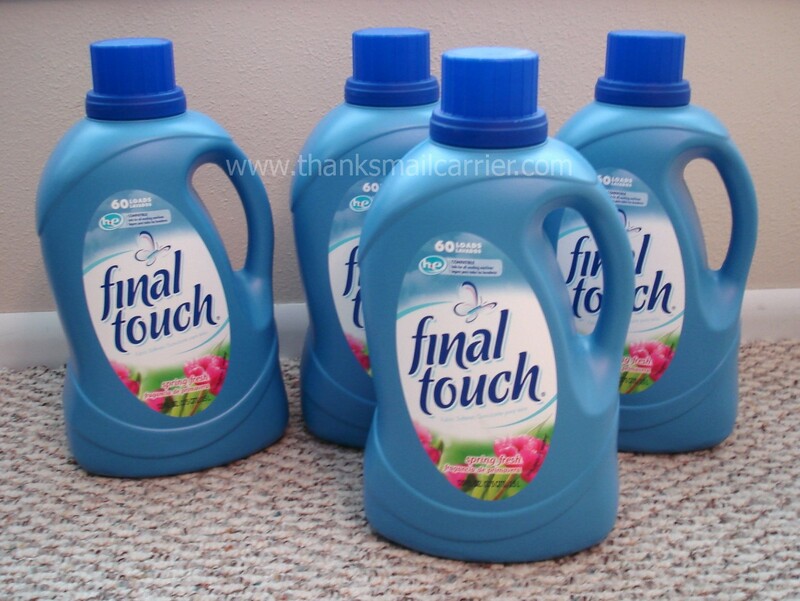 I would love to have Tide with Touch of Downy Liquid Laundry delivered straight to my home! Entered Lalaloopsy Silly Hair Doll giveaway. I'd love to have the AJAX 2X HE Liquid Laundry Detergent. What a fantastic price. I follow CleanItSupply on twitter as humanecats. I like/follow CleanItSupply on Facebook as Ricky Todd. I like/follow you on Facebook as Ricky Todd. I would love to have Kleenex in bulk; we go through so much of it! I would like to have Bounty paper towels in bulk. I can never have enough Clorox Wipes - never tried the Lavender Scent Disinfectant. For us it's paper towels, there are never enough here! Thanks for hosting, I love that the fabric softener has a butterfly on it! I would love 2X Ultra Liquid Tide Laundry Detergent. Trash bags! Toilet paper and Go-Jo hand cleaner, for the garage. Seems like I am always buying those things!! If I bought something in bulk from Cleanitsupply.com I would buy AtEase Safe&Soft Flushable Personal Wipes. I would love to have Tide delivered in bulk. I'd like to have Charmin Toilet Paper - Ultra Soft delivered in bulk.